Fast Fashion has become one of the biggest offenders toclimate change yet it is not included in the Paris Agreement, in fact it is number2 being beat out by oil. When we thinkabout reducing our carbon footprint we don’t think about our clothes, that’s becauseno one is talking about it. Textileproduction is producing 1.3 billion tons of CO2, that’s more than internationalflights and shipping by boats. This industry makes up 10% of carbon emissionsglobally, makes me wonder why they are excluded from the Paris Agreement. To methat’s mind blowing, who ever looked at their consumption of clothes was doingso much damage to our environment but what exactly is fast fashion? Fast fashion is just like fast food, they produce cheap, lowquality items quickly for fast consumption. They are throw away items that won’t last beyond a year, 60% of whatthese companies produce ends up in landfills within a year. It’s estimated that 11 million tons arefilling our landfills every year in just America. These companies are pumping out new trendsquickly and often to make us feel we need more but do we really need more? Weare purchasing 400% more than we did 20 years ago, 400% and 60% of that will bethrown away. Which is why I’m putting my focus on the Capsule Wardrobe, thelean closet. It started when I went toclean out my closet and I saw how much I was getting rid of and I tried to addup how much that waste cost me. As I did more research on the concept of creating a CapsuleWardrobe I began to learn more about how our consumption for fashion hasimpacted our environment, slave labor and started to ask why I thought I neededso much. I read once that in some thesecountries we were having produce clothing to feed our hunger are so grosslyunder paid, its estimated in some countries only 2% of women make a livablewage I honestly felt responsible. Here Iwas shopping at Zara for myself and three girls because let’s face it they arecheap and what I was really doing was supporting slave labor. Change, real change starts with me and you.The question, how many black dresses or blue jeans do you truly need or thatyou actually wear? I had 15 blackdresses and 20 pairs of jeans but in being brutally honest with myself I reallywore 3 of the dresses and 5 pairs of jeans but it’s not just our desire formore that is the problem. Let’s focus a little on the materials, the process of makingthese items and dyes that have made this industry number 2. 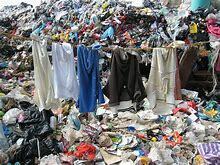 Polyester, a material I abhor with every inchof my being, are made from fossil fuels and crude oil so emissions from makingthis synthetic material is much higher than other synthetic materials. To make a single polyester t-shirt emits 5-5kg C02e while a cotton t-shirt is 2.1 but its not just emissions that isharming our environment but the amount of water used to make our clothes. One t-shirt uses 2700 liters of water and apair of jeans uses 7000 liters of water, that’s just for one. We are creating deserts in countries creatingdisastrous conditions for wildlife and humans but the dyes are pollutingwaters. In Australia they say they havea river that has turned blue from the toxic dyes that are being seeped intotheir water. 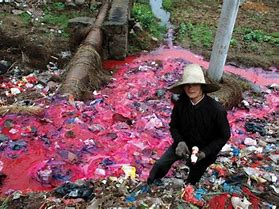 The issue for me is we have the technology to fix this, somecompanies are exclusively using renewable materials and nontoxic dyes. Companies like People Tree and Amour Vert are focusing oncreating fashion that is better for our environment. Amour Vert makes the best t-shirt out ofbamboo and it is the softest tee I’ve ever worn. They only use nontoxic dyes and I have had noissues with my black tee fading, they look as good as the day I bought them (2years ago) and for every t-shirt you buy they plant a tree. Theses types of companies are not overproducing and like the concept of the French Capsule Wardrobe they create asmaller inventory of items that can be worn several ways and for years tocome. So instead of over consuming itemsthat have no real value in your closet of life opt for higher quality itemsthat work for your lifestyle. Learn howto wear what you have several ways and several seasons, yes it cost more initiallybut in the end you will save a fortune. We don’t have to be a slave to fashion, we don’t need a new wardrobeevery season of every year. Take care of your clothes, shoes and bags. These are investments in you so treat them with respect.